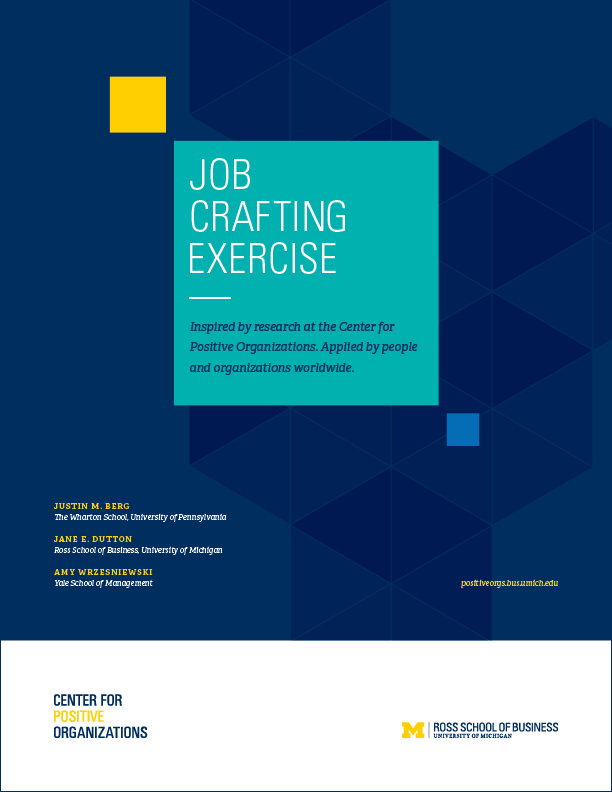 The Job Crafting™ Exercise helps you make your job more fulfilling and engaging. This interactive tool allows you to view your job as a flexible set of building blocks. Using this unique perspective, you create a visual plan for redesigning your job to better suit your values, strengths, and passions. The result is a more optimal fit between you and your job, boosting your happiness and effectiveness at work. To purchase the Job Crafting™ Exercise, please click the “purchase” link to the left. Self-development: People do the JCE on their own–you can just purchase a booklet for yourself and start crafting. Group Workshops: Organizations invite employees to complete the JCE in professional development workshops. See Two-Hour Workshop Outline. Classroom Teaching: Instructors use the JCE to teach students about job crafting theory and how employees can and do redesign their own jobs, providing a complementary perspective to traditional, top-down views of job design. Request a PDF of the teaching note for instructors here. One-on-One Coaching: Coaches guide clients through the JCE. * One workbook required per participant. The concept of job crafting captures the active changes employees make to their own job designs in ways that can bring about numerous positive outcomes, including engagement, job satisfaction, resilience, and thriving. The following briefing introduces the core ideas of job crafting theory for management students by defining it, describing why it is important, summarizing key research findings, and exploring what it means for employees, managers, and organizations. Download What is Job Crafting and Why Does it Matter (132K PDF). Berg, J. M., Dutton, J. E., & Wrzesniewski, A. Job Crafting and Meaningful Work. In B. J. Dik, Z. S. Byrne & M. F. Steger (Eds. ), Purpose and meaning in the workplace (pp. 81-104). Washington, DC: American Psychological Association. Berg, J. M., Grant, A. M., & Johnson, V. When callings are calling; Crafting work and leisure in pursuit of unanswered occupational callings. Organization Science, 21(5), 973-994. Berg, J. M., Wrzesniewski, A., & Dutton, J. E. Perceiving and responding to challenges in job crafting at different ranks; When proactivity requires adaptivity. Journal of Organizational Behavior, 31(2-3), 158-186. Wrzesniewski, A., & Dutton, J. E. Crafting a job; Revisioning employees as active crafters of their work. Academy of Management Review, 26(2), 179-201. Wrzesniewski, A., LoBuglio, N., Dutton, J. E., & Berg, J. M. (2013). Job Crafting and Cultivating Positive Meaning and Identity in Work. In A. B. Bakker (Ed. ), Advances in Positive Organizational Psychology (Vol. 1, pp. 281-302). London: Emerald. Google’s Favorite Psychologist Explains How the Company Retains Top Talent. BusinessInsider.com. Goth, Aimee (includes video interview with Adam Grant, who mentions use of the Job Crafting Exercise at Google). Help Your Best People Do a Better Job. BusinessWeek.com. Tasler, Nick. Hate Your Job? Here’s How to Reshape It. Time.com. Caplan, Jeremy. Want to be Happier at Work? Learn how from these “Job Crafters.” FastCompany.com. Zax, David. The #1 Feature of a Meaningless Job. Psychologytoday.com. Grant, Adam. Don’t Love Your Job? Fix the Job You’re In. Entrepreneur.com. Hurst, Aaron. Fall in Love with a job you don’t even like, in three steps. CNN.com Allen, David G.
The Job Crafting Exercise has enabled team members to more clearly define how their values, strengths, and passions connect to what they do on a day-to-day basis. This insight has really helped people identify who they are and tap into what is most important to them at work, which has made a tremendous difference for us. The Job Crafting Exercise has become a key component of our leadership training program. It gives leaders a powerful, creative, and clear method for reshaping their roles in ways that are not only inspiring and productive for them, but also for their teams. This innovative tool never fails to earn high ratings in our program evaluations.